As residence of the Tsars of Russia, and now as one of the richest museums in the world, the Hermitage in St Petersburg has long been a favorite haunt for locals and visitors alike. The fine detail of the painting on this item, with the palace entwined in a delicate morning mist, lends a consummate elegance to the image. 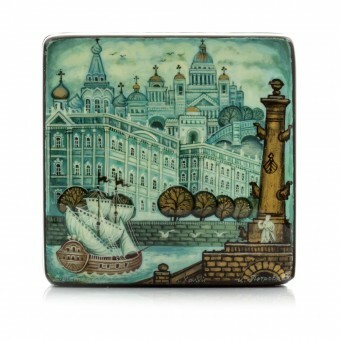 The lacquer box also features another symbol of St.Petersborg - Rostral column. The highly skilled painting techniques used in the Kholui tradition ensure that the warmth and suppleness of the lines in the picture enchant while encapsulating an inimitable charm. This is a limited edition, featuring only 30 boxes. Each box is marked the number. Lacquer boxes are created by hand using time-honored techniques of Russian master craftsmen. Items might slightly differ from the sample in painting details and shape.